What is the White Temple? 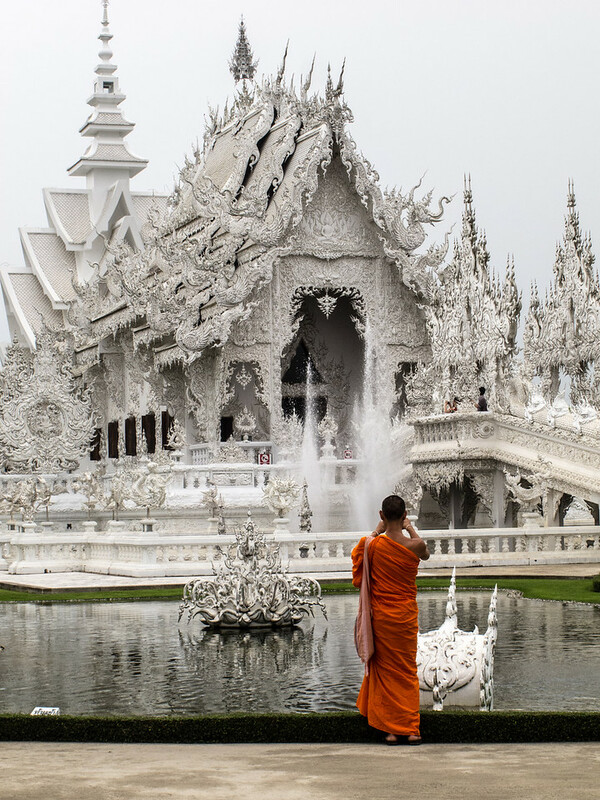 The White Temple in Chiang Rai, Thailand, known to locals as Wat Rong Khun, is an unconventional, contemporary Buddhist temple designed by local artist Chalermchai Kositpipat. Construction began in 1997 but is ongoing, and the sprawling complex is not expected to be completely finished until 2070. Kositpipat, a deeply devout Buddhist, known mainly for his religiously themed paintings, wanted to build a temple that of the outside resembled heaven on earth with the white color of the temple representing the Buddha’s purity. What Makes Wat Rong Khun So Unusual? There are aspects to the White Temple that you don’t expect to see at a Buddhist temple. As you cross the central bridge to the main temple, you pass an ocean of grizzled hands, greedily reaching up from the bowels of the earth, symbolizing greed and desire. More unusual still are the murals inside the temple (unfortunately photography not allowed) of Harry Potter, Superman, Angry Birds, Hello Kitty, Neo from “The Matrix” and Batman among others. There is a mural of the Twin Towers with a gas hose snaking around and airplanes crashing into them. There is even a mural depicting George W. Bush gleefully riding around on a nuclear rocket with Osama Bin Laden. Kositpipat believes these depictions of the modern world further the Buddha’s message. I am reminded that all art is contemporary when it is created, and sometimes we need to view it through the prism of time before its real significance can be distilled. The White Temple is genuinely one of the most fascinating places of worship I have ever seen. It seems that around every corner is yet another surprising image. 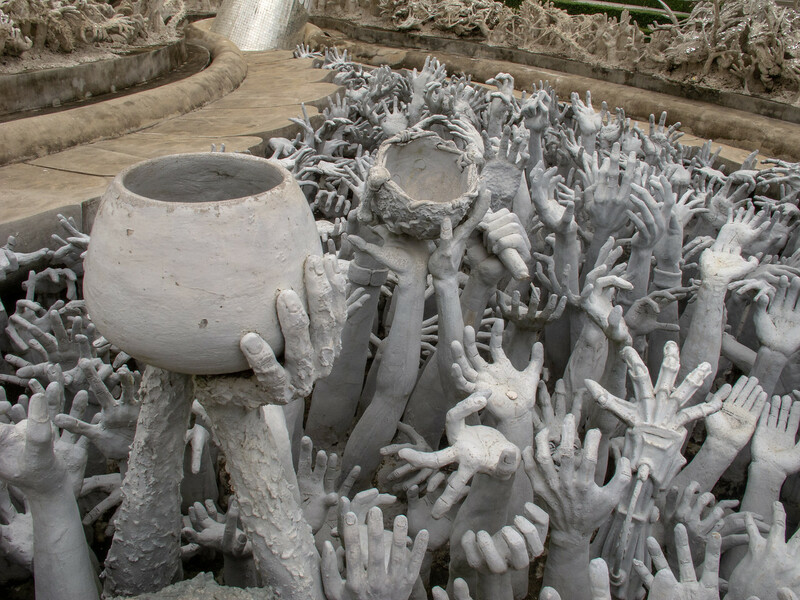 Wat Rong Khun is one of those places that haunt you long after you have visited. It is too much to take-in in one visit, and I hope to see it again soon. 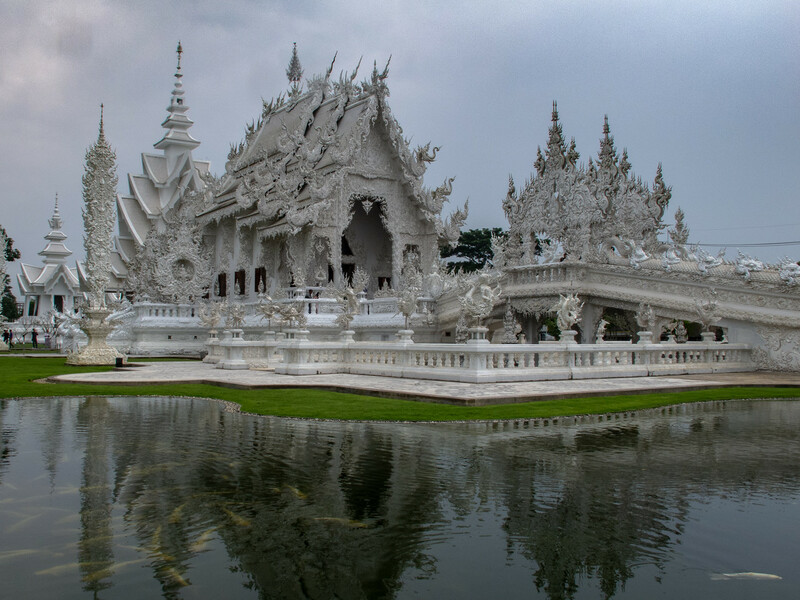 The White Temple is located just off Phahonyothin Road about 15 kilometers south-west of Chiang Rai. If you are driving yourself, it’s clearly signposted and there’s plenty of car parking. If you don’t have your own transport, the easiest way to get there is by private air-conditioned taxi. The ride from Chiang Rai takes around 20 minutes. It’s also quite easy to get the White Temple using public transport. Regular buses or songthaews live from the center of Chiang Rai near the night bazaar. The White Temple is open daily from 08:00 -18:00. Note: the temple gets really busy on weekends and Thai holidays. Ideally get there before 11:00 before the large tour buses start arriving. Thank you for sharing this! It is a beautiful temple and the history behind it is very interesting. Thanks Mary! It is one of the most beautiful, strangest, places I have even seen.